About a year ago I created a Facebook application just for the sake of trying to create one. Thanks to the Dapper service, the process was fairly easy to create a one-stop shop for library technician job postings in Canada. Lately I’ve noticed that the listings were no longer being updated in Facebook even though the RSS feed still worked. It turns out Dapper is shutting down their support of their Facebook App Maker so I’ve decided to close down my Facebook App. I was able to get 22 Fans of my application so hopefully some people found it of use. I’ve decided to migrate the service to a new page using free web page provider synthasite.com. 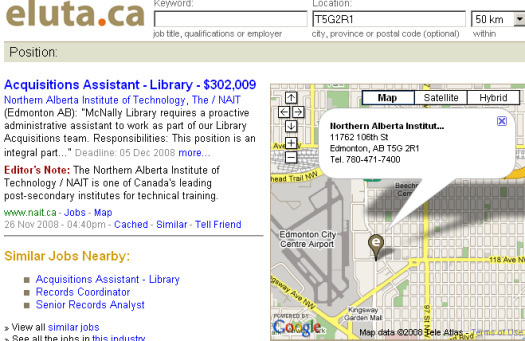 Canadian Library Technician Jobs is a basic site that uses a Spring Widget to showcase the latest job postings. Quick, apply for this job! A fair amount of my time spent at work involves informing faculty and other staff about copyright issues and trying to ensure that the employees of the school avoid egregious violations of copyright. A cloudy issue that often comes up is the in-class viewing and linking-to videos on YouTube. As we all know there is a vast amount of content that has been up-loaded there without the permission of the actual copyright holder (and YouTube’s owner is dealing with a major lawsuit due to this reality). When faculty ask about linking to this content we advise them against it. Obviously there’s about a .0001% chance of the school getting in to any legal trouble by giving teachers cart blanche to link to whatever content they can find on the Internet. However, that isn’t really the point. If pushed for a justification for our policies I would say, “how would you feel if some guy in his basement scanned a bunch of pages from a book you wrote and put it up on some site where anyone could view it, copy it, print it, etc. ?” (this is obviously happening more and more). In my mind that type of copying and distribution of someone else’s work is equivalent to someone taking a substantial portion of a TV show, movie, etc. and just uploading it to a service like YouTube. Schools also spend a lot of time and effort creating policies for students to properly cite their sources, avoid plagiarism etc. The blog entry embeds a YouTube video of the classic School House Rock video about the U.S. constitution. When you click on the link you see that it was uploaded by the immortal Dogboy2709. I don’t think I’m going out on a limb by saying that he is not the legitimate copyright holder of the video. So you admit it is likely a copyright violation for this video to be on YouTube. But you not only link to it, you embed it? I know America has the DMCA which provides video sites like YouTube a lot of legal protection as long as they remove a video after they are alerted that it is an infringing copy. Even with the lack of any legal jeopardy, I don’t think this blog entry sets a particularly good example when it comes to respecting people’s intellectual property. There’s an article from Cnet that goes in to some more details about why this site, who existence seems to run counter to every copyright law I can think of, is still up and running. It seems our good friends at the PRQ are keeping it up and running and given their propensity for wanting to “stick it to the man”, the site will likely be there for some time. I can’t condone going to the site to check out the new issue of Maxim with Anna Kournikova on the cover but I can imagine there are some people out there who will. These cost estimates are below what they would likely be in a Canadian academic library. This study used an average librarian salary of $23.77, which is quite a bit lower than the librarians where I work (heck, even I make more than that). The financial difficulties spiraling through the US economy are expected to hit Canada hard fairly soon. When increased pressure on library budgets start to set in, I think it is inevitable that the trend of library technicians working extended shifts at the public reference desk will become more and more common. I came across the site Mygazines a few days ago. From my experience working on copyright issues I can’t understand how it has not been flooded with takedown notices. The site appears to consist of hundreds of popular magazines, scanned from cover-to-cover. I don’t think I’m going out on a limb when I say that this is being done without the permission of the actual publishers of the magazines. Looking at the Contact Us section I see no information about an actual address, phone number, etc. I’m guessing the site’s servers may be located in some Baltic republic or other former Soviet satellite state which tend to take a “relaxed” standard to copyright law. If no one tries to take the site down, libraries may be able to save a lot of money on periodical subscriptions. At least on the popular magazines, I haven’t been able to locate any of the dry, peer-reviewed journals we academic libraries are known for. I must admit that the temptation to read the latest issue of Mojo (without paying for it) is hard to resist but the existence of sites like this make it harder for us copyright cops to tell faculty they need permission to upload a scan of a Ziggy cartoon to their Blackboard page. While going through my WordPress stats I saw that someone had used the search term, “library technician lack of job toronto” to arrive at my blog. I’m glad to see people are finding links to my library technician job postings mash-up, but I noticed that this search term also brought up a link to this blog posting. Library Tech Confidential is a very attractive looking blog (he’s not a cheapskate using a free hosted WordPress blog like I do) written by a Canadian library technician. It’s always interesting to see what other Seneca library technician grads are up to, let alone another male technician. The comments made by “Esther” and the response from the site’s authour in the comments section of this posting bring back some memories of my job search after graduation. So check it out for another view of libraries from the “para-professional” point of view.